The Sacramento River and Feather River systems in Northern California are now over two weeks into the 2018 salmon season. And to be honest, things couldn't b looking better for NorCal salmon anglers. The July 16, 2018 salmon season opener proved to be successful for most anglers who took to the Sacramento River for the opening day of the 2018 season. After the last four years of essentially no Fall Run Chinook Salmon showing up in river prior to the season opener. The sight of salmon jumping and being caught in almost all the popular salmon fishing holes, was a welcome sight. Norther California salmon fishing guides along with recreational salmon anglers all enjoyed the action on the opening morning of the 2018 salmon season. As rods were getting slammed by big adult king salmon weighing up to 24 pounds. Most boats fishing for the king salmon were rewarded for their efforts, with at least some action. A fish or two a boat seemed to be the overall average for most boaters, who's captain contained at least some knowledge of salmon fishing. This average take of a salmon wasn't area specific on the Sacramento River. The action took place from Red Bluff, Ca down through Hamilton City, Ca. Where the scenario was the same, with a most knowledgable boaters fishing for the chrome, hard biting, and fighting early season king salmon. Getting a salmon or two per boat. There was of course some highlights who pulled the newly changed daily bag limit of (one salmon per person) out, and got limits for their passengers. Like fishing guide Dakota Dienes, a local from Corning, Ca. Who has followed closely in his well known and respected grandfathers ("The Fishing Magician", Frank Townley) shoes, after his passing several years ago. Dakota put his boat back on the trailer with limits for three people just after noon. A private recreational salmon angler, also from Corning, Ca but fishing out of the Los Molinos, Ca boat ramp, also did exceptionally well on the 2018 season opener. Johny Eller with wife Alicia Eller, and several of his guests for the day, managed to hook around 10 of these early season kings landing a half dozen. A very impressive start to the 2018 season on the Sacramento River. There were of course some anglers who never got the opportunity to tangle with one of these dime bright beasts. And like salmon fishing guide Mike Rasmussen of salmonsacriver.com , who was fishing out of Woodson Bridge. Just couldn't get them to the boat. Rasmussen hooking and fighting five king salmon only to loose all five. As well as missing two other grabs just to ad insult to injury! All in all the opening day could certainly be considered a success if compared to the last handful of seasons here in Northern California. Recreational salmon angler Johny Eller from Corning, Ca poses with a great king salmon he caught while back bouncing a sardine wrapped KwiKfish. While fishing the Sacramento River near Corning, Ca. 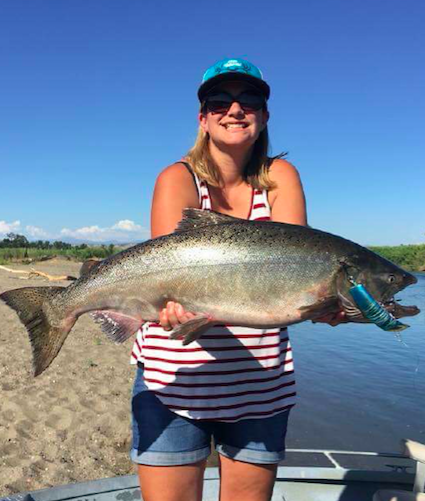 Alicia Eller caught this big beautiful king salmon on the Sacramento River below Woodson Bridge in Corning, Ca while fishing with her husband Johny Eller (pictured above). The husband and wife duo have been finding great success using K16 Kwikfish to trigger the kings to strike. Although moral on the Sacramento River side of the valley is higher then it has been in a half a dozen years, when it comes to the north states salmon fishing. It is still a far cry from what used to be the norm. For decades on the Sacramento River salmon season opener on July 16, limits were the rule on opening day here in Northern California. The opening morning scene at the Red Bluff Diversion Dam ( which with the exception of the last five years was closed and arriving salmon had to navigate a fish latter at the dam ) was one to remember. Fishing boat after fishing boat, launched their boats the night before the opener. Dozens and dozens of boats sat opening morning in the dark with their red and green navigation lights on. For hundreds of yards below the Diversion Dam they could be seen awaiting the staring time. It was quite a sight to see when looking down river on the fleet of salmon fishing vessels. Everyone would show up for this event. And everyone caught salmon. Limits usually! The second legal fishing time began multiple hook-ups could be seen at one time. Minutes later a dozen boats would be hooked up at the same time, and for a couple hours. Every opening day the salmon fishing on the Sacramento River was as good as it gets. Adam and Cindy a husband and wife couple who reside on the Sacramento River near Red Bluff, Ca got this pair of quality king salmon while drifting cured salmon roe. Great work from the recreational fishing community this week. This cranky salmon slammed fishing guide Mike Rasmussen's plug head on. The action of the lure drives the king salmon into a violent strike when they get to close. The Sacramento River has rich history in plug fishing, and is a technique fading away fast to new techniques that are being developed every year. This past week on the Sacramento River fishing guide Mike Rasmussen reports steady action during the week, and difficulties pinning fish down on the weekends. Blaming it on the increase in boat traffic from the working class avid salmon anglers. The salmon that are being caught are quality kings averaging 15 to 24 pounds and comprised of almost all females. The salmon are in great shape this time of year and cut very nicely. There are plenty of salmon in the river from the Diversion Damn in Red Bluff, Ca to Hamilton City, Ca. Although higher river releases from Keswick Dam can sometimes make it difficult to pin down the salmon. With plenty of room for them to move off to the side of a hole and hide when your presentation comes down the river. Getting the anger driven reaction bite needed to put these bright salmon in the fish box, can be much harder to get if they can simply move aside and let the lures go by. Rasmussen reported he was picking up his salmon in mid to late afternoon, while lure fishing K16 Kwikfish wrapped with sardine. The local fishing guide also noted the bright, strong, adult chinooks have been tearing off the lures with ease, with these increased flows. To much pressure during the first few minutes of the fight are costing missed opportunities. Switching from a standard K16 or K15 Kwikfish which are very popular sizes traditionally, while lure fishing on the Sacramento River. The much smaller profile of a K14 Kwikfish or a Yakima Bait Co. M2 Flat Fish allows for more mouth around the lure! The smaller profile of the lure allows the angry and aggressive bite of the king salmon to fit more of the lure in its mouth. In turn allowing the treble hooks to find their home deep behind the jaw bone, as apposed to the gums or lips of the fish. Which usually result in the tear off's just after hooking one. Roe has also being used by fishing guides like Jeff Brady of Brady's Guide Service Mike Rasmussen of Mike's Guide Service, and for recreational anglers like and Adam and Cindy who live on the Sacramento River south of the Red Bluff, Ca Diversion Dam. Drifting ( Boondoggling ) has been the primary technique utilized when using cured salmon roe. It's not threatening approach is much different then that of the lure fishing. And has been putting a extra chrome king salmon or two in the fish box every day. Diversity pays off as well as thinking outside the box a little. If you repeat the same process time and again and it isn't working, you may want to try something new, or somewhere new. Bob Piziali from the Bay Area holds up a dime bright Sacramento River chinook salmon he caught on a recent fishing trip with guide Mike Rasmussen of Mike's Guide Service. This week on the Sacramento River in Northern California ( August 1, 2018 ) the upper portion of the salmon fishing grounds comes into existence. With the opening of salmon fishing above the Red Bluff, Ca Diversion Dam. This includes the world famous "Barge Hole" at the mouth of Battle Creek near Cottonwood, Ca. Expectations are high this year as chrome adult chinook salmon have been arriving and staging for over a month now. And it is thought that this opening day a couple hundred salmon will get caught in the barge hole alone, on the opening day free for all. The canyon region from the Bend, Ca boat launch to the Jelly's Ferry launch are also expected to hold good numbers of staging salmon as they tuck away in the 40 and 50 foot holes and the 54 degree water temperature. Setting the stage for a epic opening day mad house at the Barge Hole and through the canyon. Opening day at the Barge Hole will give a good indication of just how many fish slipped by the lower river in the past few weeks! Ryan Tripp from Oroville, Ca holds up a Feather River king salmon he caught using the k16 kwikfish stuffed in the mouth of the salmon pictured. The Feather River is starting to load up with newly arriving kings. There are at least 90 days of good salmon fishing still ahead of us and two more big groups of salmon that will show up just after the big full moon phases of August and September. If you like the outdoors and want to see the most beautiful stretch of the Sacramento River in it's canyon region. All while catching quality king salmon with a local and professional salmon fishing guide like Mike Rasmussen ( 530-722-8876 ). Call for reservation today. We have multiple boats heading out daily.